Some of you may know, but I have been blogging for about 13 years! I started my first blog when I was a seventh grader. I would type up posts on my mom’s clunky PC in her office space at home, and post them to Blogger (the “it” blog platform back in the day). I never got rid of my blogs… just kind of abandoned them when I grew out of them. I recently went back through the archives of my old sites and found some amazing photos of my childhood bedroom. I thought it would be really fun to show you how my style has evolved! My childhood bedroom had the most incredible light. There were two full walls of windows! It overlooked our backyard, full of beautiful mature trees. I have so many memories of this sweet room. It was small, but I made the most of it and decked it out with my favorite pages from fashion magazines, trinkets and tons of jewelry. I begged my mom for this mannequin because I was really into fashion. I was convinced I’d go on to write for a fashion magazine like Teen Vogue, or become a designer! I would style the mannequin a million different ways (LOL at the shrug on the right… I can’t believe that was even a thing!) and have so much fun developing new “looks” with my existing closet. This was my Juicy Couture phase, so you know that the velour zip up jackets were brought out on display! I was also a voracious reader and crafter (see my messy desk below). I was still just as obsessed with musical theater — the only difference was that I played soundtracks on my boombox, not Spotify. These photos make me smile! I was definitely going through the transition from little girl to teenager and looking back, I have a great appreciation for the fact that I was still creative and playful as I finished middle school and entered high school. Kids these days grow up way too fast! I was SO excited to deck out my dorm room when I got to Mizzou. As soon as I knew where I was headed for school, I started collecting things for my soon-to-be-space. I only lived in my dorm for a semester, and actually moved into the Kappa Delta house second semester of my freshman year. So this layout was short-lived, but I made sure to document it! As you guys can tell… my love for color hasn’t changed. Same as my love for collages. I was so excited that there was a built-in pinboard for me to deck out. I think I put together that collage on my very first day, right after my parents said their goodbyes. My bedding was from Garnet Hill, and I used the quilt, comforter and sheet set through my sophomore year, since we had bunk beds in Kappa Delta. Now, we actually use the quilt as our family picnic blanket! It’s the cutest thing and I hope I can pass it down to a daughter someday for her first childhood room. I had to dig through my Instagram archives to find this very low quality shot (sorry!) 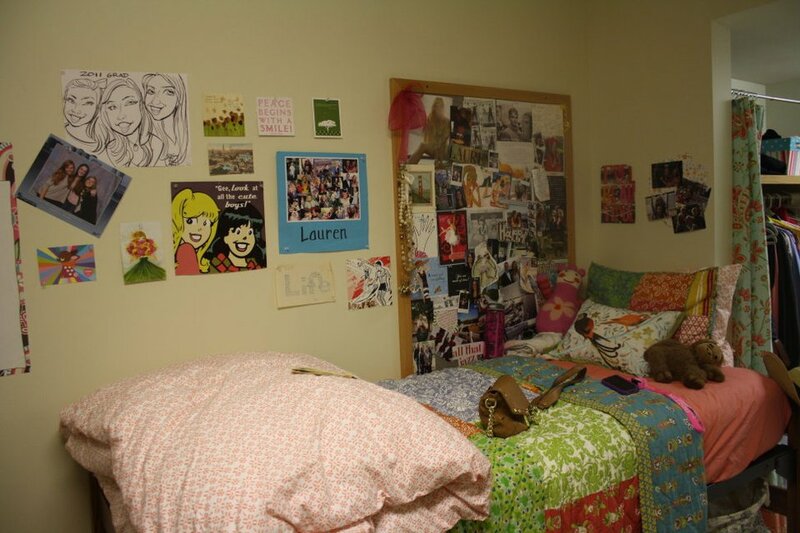 but this was the only photographic evidence I seem to have of my tiny apartment bedroom my senior year of college. My mom bought me this bedding from Anthropologie and as you’ll see below, I ended up transitioning it into my post-college bedding as well. I lived at home with my parents for one year post-grad. It was a really hard year, full of lots of insecurities and doubts. At the same time, I became so much closer with my parents and am infinitely grateful that they let me move back in when I needed it the most. I was definitely ready to go when I moved out, but now I enjoy visiting once or twice a month and falling asleep in this cozy space! Most of the decor is thanks to my mom, who has a great eye for style! We did pick out that sweet little chair together at a home consignment store. My first apartment in the city was one I found on Craigslist! It was two blocks from Fort Mason on Buchanan Street, and my room was actually a converted dining room! It had a pocket door that led out to the kitchen. It was very tiny but I was determined to make it cozy from day one. I found the dresser on Craigslist, and the mirror from Home Goods. Both accompanied me to my new apartment. I moved into one of the back bedrooms after a year in the apartment - much more space! And here we are: my current space. Things look pretty similar to my last apartment, in the sense that I haven’t bought any new bed linens. I love crisp white bedding because it’s so easy to dress up with fun pillows and throws. The only thing I miss was not having to put my bed against the wall! But for now, having it in the corner is the best use of space. Well, that concludes my throwback Thursday! What did you think? How has your style evolved over the past decade? I’d love to hear about it in the comments below.